A firm cheese with a buttery flavour. Ideal for melting and using with a Raclette grill. Originally, Raclette was made only in the Swiss canton of Valais. Its production there dates back over 100 years, and the shepherds made it from raw milk in their mountain huts. 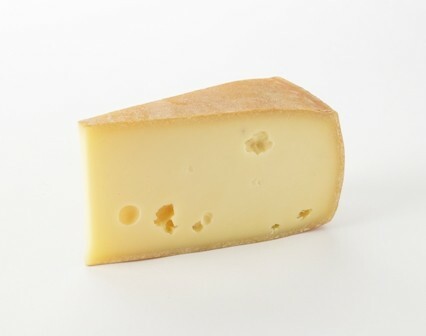 More recently, however, it became more difficult for the Valais region to meet the increasing demand for the cheese and in consequence, Raclette has become a generic term for a number of similar Swiss and French cheeses made from the mountain pastures. Paxton & Whitfield Raclette is from Savoie and made entirely with raw milk supplied by the farmers of the five communes of the Chambotte Massif, and matured by exceptional affineur Joseph Paccard. Raclette is made by mixing the milk, rennet and cultures and then draining, heating and pressing the curd. The natural crust is then brushed every two days for four weeks and for the next month it is cured and brushed weekly. It cannot be sold until it has ripened for at least eight weeks, is optimum after a maturation period of around 5 months and is best enjoyed through the autumn and winter months. Primarily, Raclette is used to make one of the best and most famous of cheese dishes, the eponimous, Raclette; the French word 'racler' meaning 'to scrape'. A Raclette cheese is cut in half with the rind removed from near the cut surface. The cut edge is then heated, traditionally over a wood fire, but in recent days using a half-moon shaped electric heater made specifically for this purpose. As the cheese melts, it is scraped off with a spatula or knife on to a plate over potatoes, pickles and meats. The rise in popularity of Raclette is widely put down to the ever-increasing popularity of Winter Sports.